ANNA MARIA – The historic Anna Maria City Pier and its restaurant will remain closed until further notice due to significant damage inflicted by Hurricane Irma. In addition to the roof being torn off the bait shop, there is extensive damage to the wooden planking on the northwest side of the pier’s T-end that faces Tampa Bay. 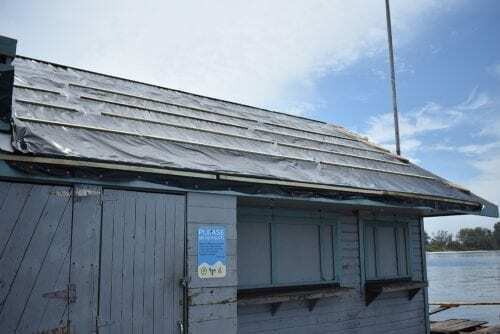 The bait shop roof has been given a temporary protective covering. A water line that leads to the pier end was damaged and replaced Friday. The damaged fire suppression system was repaired Friday. A missing support bent consisting of two pilings and a crossbeam located near the pier’s midway point was also replaced Friday. 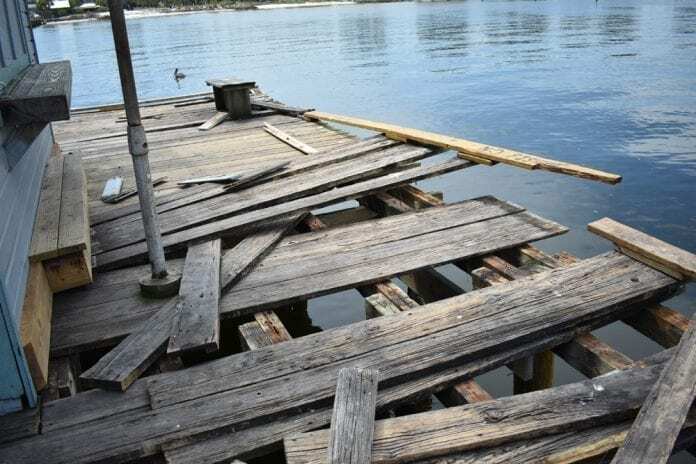 The Tampa-based Ayres Associates engineering firm conducted a structural assessment of the pier damage on Friday and Anna Maria Mayor Dan Murphy is expected to have the report by Tuesday, Sept. 19. The Ayres report will help determine if the pier can be repaired and reopened. If Ayres deems the pier structurally unsound or not financially feasible to repair, the previously planned $2 million pier rehabilitation project will be accelerated to get a new pier in its place. Last week, Murphy took each of the five city commissioners on separate tours of the pier. Murphy and Commissioner Dale Woodland spent about 20 minutes at the pier end Thursday afternoon examining the damage. Murphy said he thought the plank damage was caused by waves and the roof damage by high winds. He also said he believed the restaurant’s smashed glass door was an act of vandalism associated with the theft of beer. Woodland suggested it might be a long time before the pier reopens, and he expressed concerns about the impact a prolonged closing would have on the restaurant and bait shop employees who work for the city’s longtime pier tenant, Mario Schoenfelder. 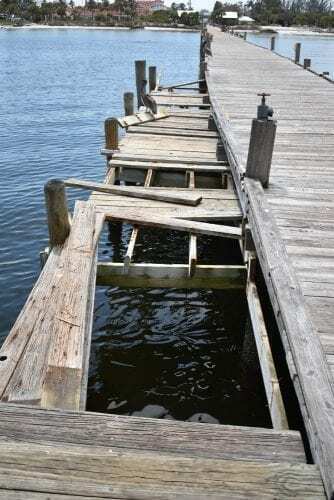 The pier damage was discussed at the Thursday, Sept. 14, commission meeting. Murphy said he already spoke with Schoenfelder, who’s in Germany, and his on site manager, Dave Sork. Murphy said City Attorney Becky Vose is researching the city’s lease options, but it was premature to discuss any lease-related actions. “The cost of all this is the city’s responsibility. The city’s in charge. We’re the ones that have to make the decisions on what’s going to happen,” Murphy said. 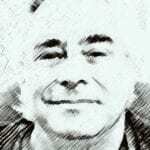 “The critical thing at this point is the structural engineering report. Included in that will be an estimate of the closing time, how long it’s going to take to repair it and the correct way to repair it,” he added. A contractor who assessed the roof damage told Murphy he didn’t recommend simply replacing the missing roof materials. He said there are no hurricane straps holding the roof in place and the roof supports are held in place only by rusted nails. “When I was out there, there were new nails in old boards that hadn’t held in the stringers, which says to me the stringers are rotten,” Commissioner Doug Copeland added. “At this point I can’t give you an estimate as to how long the pier’s going to be closed. This is pretty significant damage and it’s going to take some time. We will get it done as quickly as possible, but it going to have to be done right and according to code,” Murphy said. He suggested the commission have an emergency meeting this week to discuss the Ayres’ report findings. “I don’t want the bureaucracy to slow this down. We’re in charge; we can get it done,” Murphy said. The commission authorized Murphy to spend up to $35,000 on the Ayres assessment.